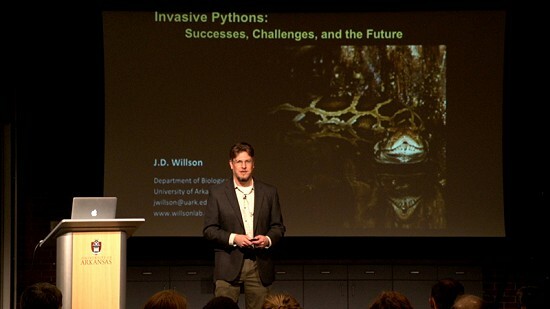 On February 13, 2019, J. D. Willson presented "Invasive Pythons: Successes, Challenges, and the Future" as part of the Pryor Center Presents lecture series. Invasive species are one of the primary threats to biodiversity, both here in the United States and across the globe. Among the myriad of invaders, few have captured the attention of scientists and the public more than Burmese pythons in the Florida Everglades. The Burmese python, one of the world’s largest snake species and a longtime mainstay of the pet trade, has been introduced from its native range in South Asia and represents one of the few cases of an invasive apex predator invading a complex continental ecosystem. Since recognition of their establishment in Everglades National Park around the year 2000, pythons have expanded in range and have been linked to severe declines of a wide array of native mammals. Yet, many gaps exist in our understanding of the python invasion and an easy solution seems unlikely. In this talk, Willson will discuss his research on python biology in Florida, within the larger context of the invasion. He will highlight what we have learned from this unique situation, the challenges we have had to overcome, and the future of snakes as invasive species. Willson is an associate professor in the Department of Biological Sciences at the University of Arkansas. His research focuses on understanding factors that drive population and community dynamics of reptiles and amphibians within the context of pressing conservation issues such as habitat alteration, pollution, and invasive species. Willson received his B.S. from Davidson College and Ph.D. from the University of Georgia’s Savannah River Ecology Lab. Current projects being conducted by Willson and his students include studies of the influence of changing land use on reptile and amphibian communities in historic prairies and long-leaf pine savannahs, long-term studies of aquatic snake population dynamics, and research on the ecology of invasive Burmese pythons in South Florida. Willson has published over sixty scientific papers and book chapters and co-authored a popular book on invasive pythons in Florida. He currently serves as editor of snake natural history notes for the journal Herpetological Review.